When I started my very first hand piecing project of my Double Wedding Ring quilt, I really had no plan in mind. I intended to make blocks until I ran out of fabric. 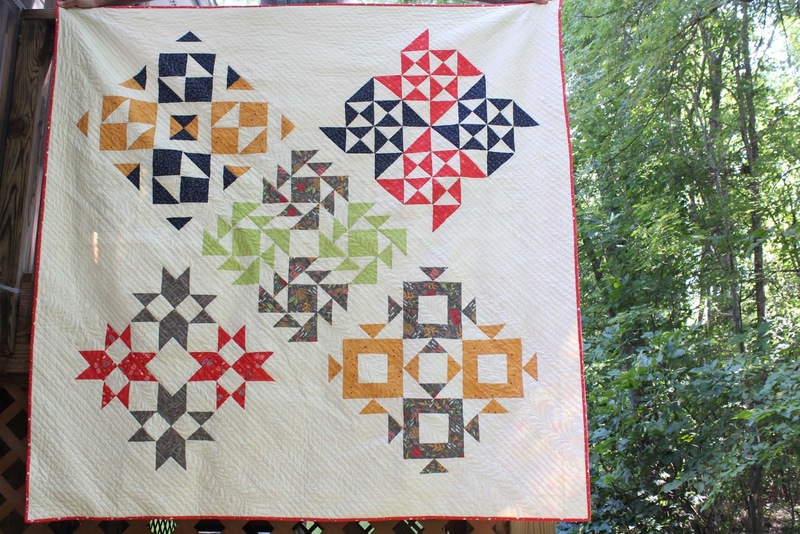 Once the quilt was assembled, it wasn't a hard decision to decide to hand quilt my hand pieced project. After some experimenting, I decided on big-stitch quilting using an awesome collection of 12 wt thread. The texture makes me so happy! I am using a plastic frame 16'' square with smaller clamps (from another frame) and scrap fabric to protect my hand quilting from the clamps. In the gray areas, I am quilting "ghost rings". I've order 3 more spools of gray (50 yards on each) and truly hope to finish this in October. The quilt design is my own. 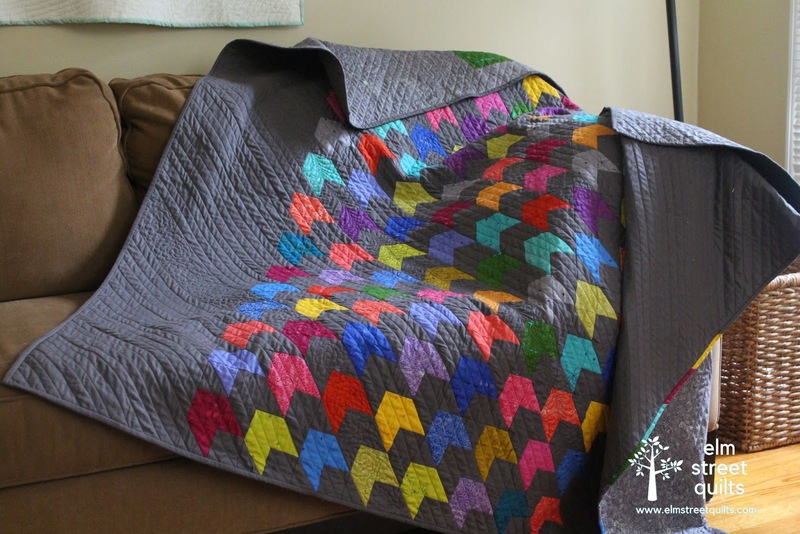 The block pattern is Tara Faughnan. The fabric is Alison Glass Sunprint 2018 plus a gray Painters Palette solid. I'll be linking up at Brag about Your Beauties, Freemotion by the River, WIP Wednesday's, Let's Bee Social, Midweek Makers. Needle and Thread Thursdays, Finish it Up Friday and Finished or Not Friday. Ready to link up your September finishes? Don't panic - this link-up is open until September 30 at 11:55 pm ET. My goal for September was to finish all the color work in my big stitch hand quilting project. I've now just have the background outside the rings to work on! There will be three winners this month - Fat Quarter Shop is offering a $25 gift certificate, Make Modern Magazine is offering a 6 month subscription to their digital magazine and Amy Ellis is offering a $25 gift certificate to her pattern store! Note - Congratulations to Barbara, Susan, Julie, and Shelia - the lucky randomly chosen participants for September and from all entries submitted in 3Q. 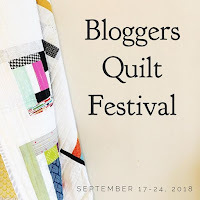 Its that time of year again - time for the Bloggers Quilt Festival at Amy's Creative Side. (See my other entry). 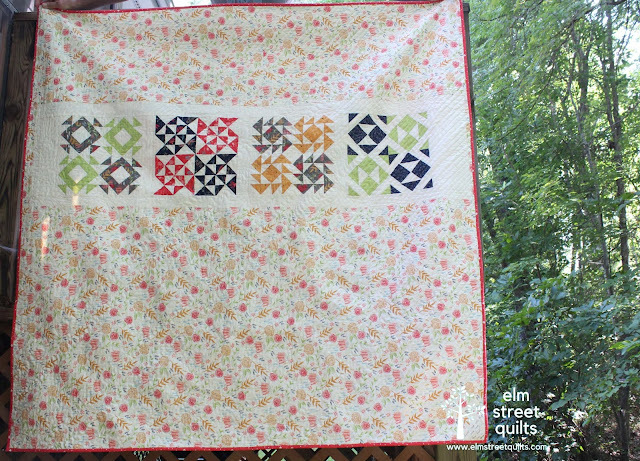 This quilt is called "Oh My Darling" - blocks created as part of Fat Quarter Shop's Clementine QAL. I went with an alternative setting and love the way it turned out. The quilt was gifted to my daughter in honor of her very first apartment, shared with her friend for their junior year in college. The goal was for it to be on their couch. I suspect it is just as often on the floor but hopefully getting used and enjoyed! Leftover blocks were placed on the back. 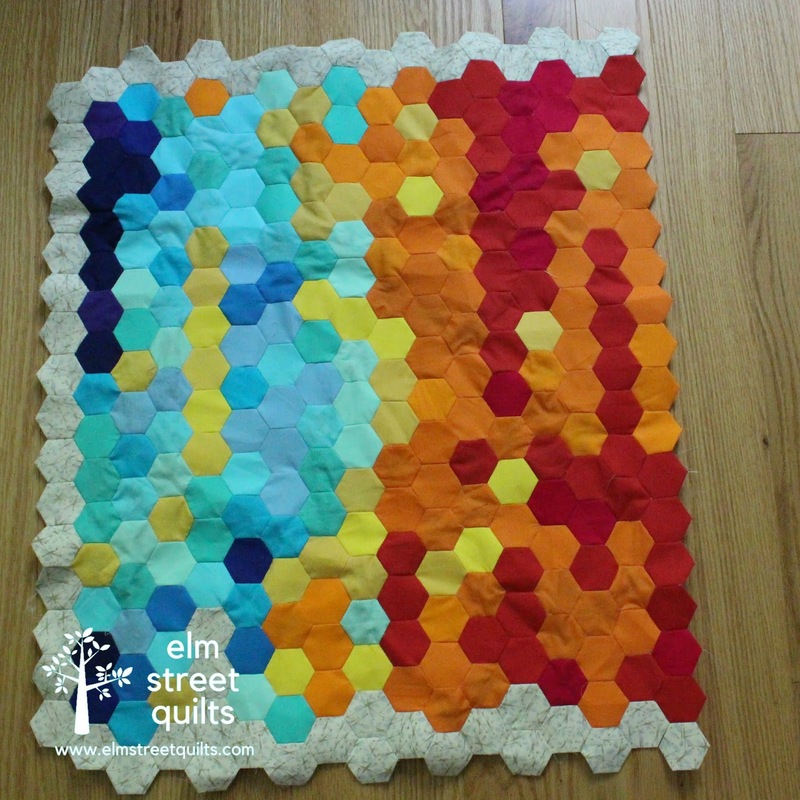 I love the way it looked but this did make the quilting process a bit more challenging! To quilt, I did straight line quilting with my walking foot on the diagonal, leaving three gaps (roughly 5'' wide) that I filled with one continuous feather. This is probably the third time I've quilted this way. I really like the way it looks and the whole process. The quilt measures 68 x 68 ''. "Oh, my darling... oh, my darling,...oh my darling Clementine...."
See all the beautiful quilts and enter your own at Amy's Creative Side Bloggers Quilt Festival! I'm also linking up at a new link-up Brag about Your Beauties. Michel Miller has a challenge for this year's QuiltCon to make a quilt using these beautiful fabrics. These are Hash Dot in Grass, Marine, Ebony plus Couton Couture in Peach. I love quilt challenges. Ideas spin around in my brain - many are quickly discarded, some make it to paper but not to fabric. 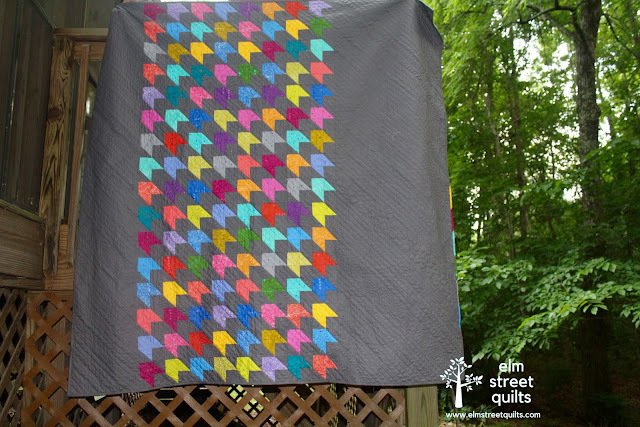 For this challenge, you must use at least two of the dots plus the solid and are welcome to add any other Cotton Couture solids to the quilt. I made lots of HSTs and used my design wall to refine the design, leaving it sitting there for about a week before I sewed anything together. The quilt top is now assembled and I'm working on the quilting plan. For now, I'm just sharing sneak peaks! 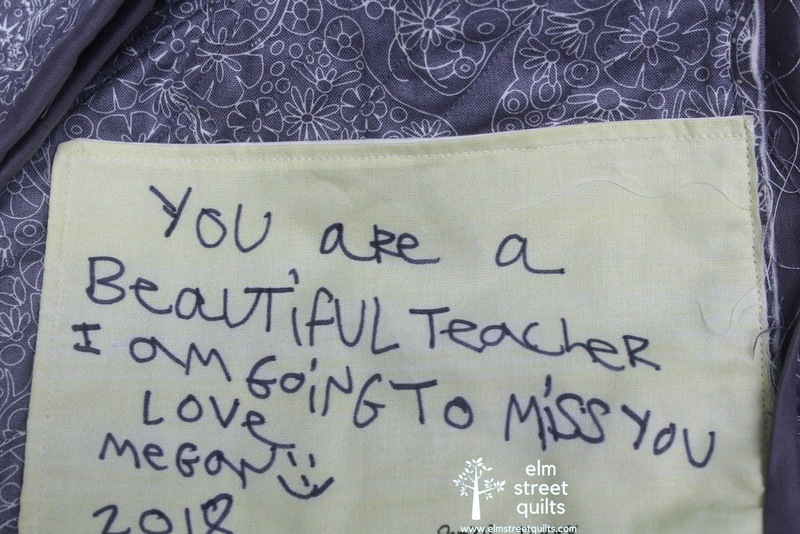 My quilt is called Encouragement and made for my daughter's teacher, Ms R. Ms R encouraged my daughter, laughed with her, advocated for her and was there for her. A special teacher needs a special quilt. My daughter finished high school in June and was fortunate enough to have the same teacher (Special Education) for five years. This quilt is my own design, using the wonderful Sunprint 2018 fabrics from Alison Glass. The best part might just be the special label my daughter created. I also used a AG print on the back and added a strip of color. The quilting was a lot of fun. I started with diagonal straight lines, mimicking the direction of the pattern. The initial lines were marked with a hera marker and then I winged it. In five places, I replaced the straight lines with some FMQ. 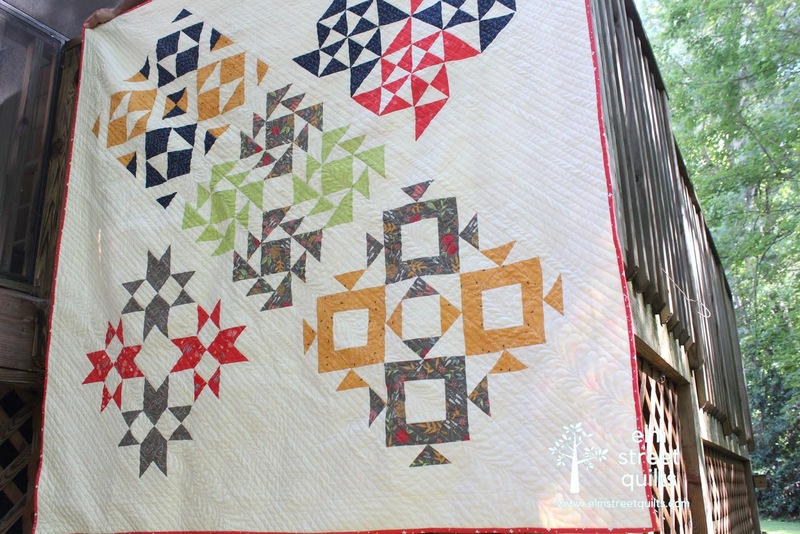 Much of the piecing for these blocks was done on a guild retreat and the colors made me smile every time I sewed with them. 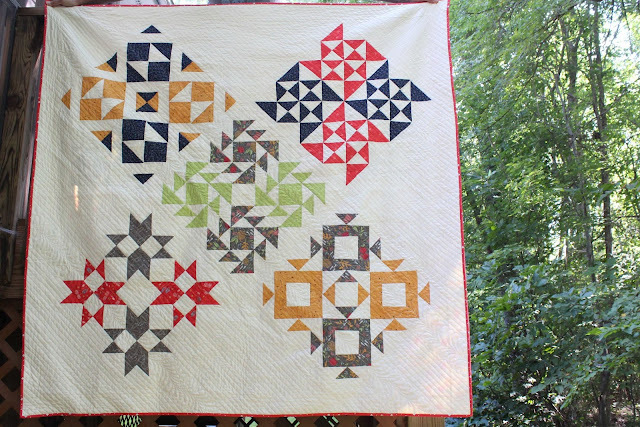 I've shared this quilt a few times on my blog because I love it. There is a story behind this fabric too. I went into my local quilt store that sells fabric by the inch and bought 6'' each of the 24 fabrics from the line. (This is equivalent to 4 yards of fabric.) 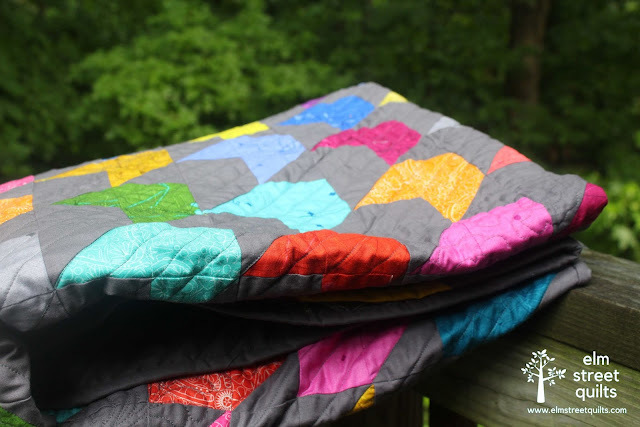 When I purchased the fabric, I didn't actually have a final quilt design but thought 6'' would give me a couple of options. 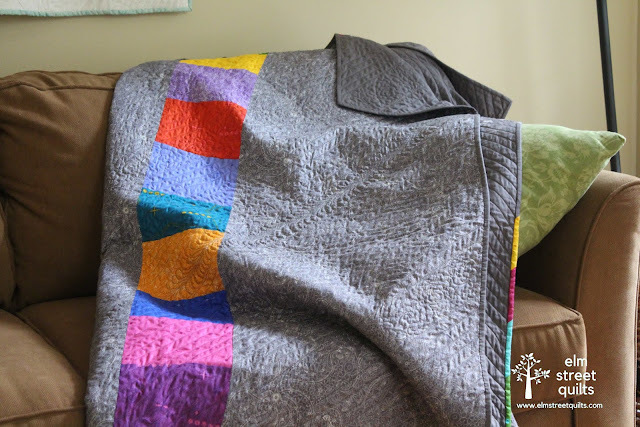 Once this one was done, loving the combination of the gray with these colors, I started a second quilt with the scraps, a quilt that I'm busy hand quilting. The quilting finished (roughly) 70 x 70''. 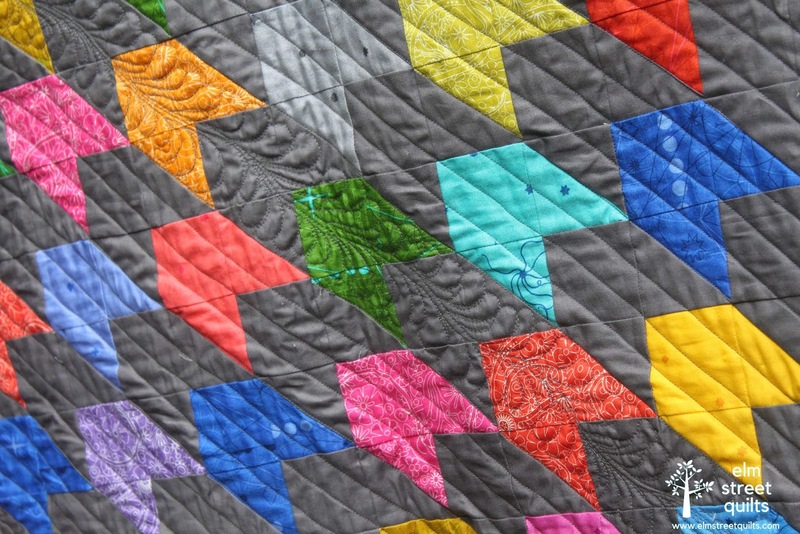 See all the quilts and enter your own at Amy's Creative Side Bloggers Quilt Festival! I am really enjoying making these downsized blocks from the Quilter's Planner QAL. These are all nine of my 6'' blocks. My current plan is to assemble them into a pillow! I love having blocks to make for a QAL in between all my larger projects. It gives one quite the sense of accomplishment! Hand work project that you are really enjoying? Check and double check. Since Wednesday morning, the track of the hurricane is now no longer coming directly over where I live in central North Carolina. (Although forecast can and do change.) As it currently stands, we are expecting epics amount of rain and some winds but not the worse part of the storm. 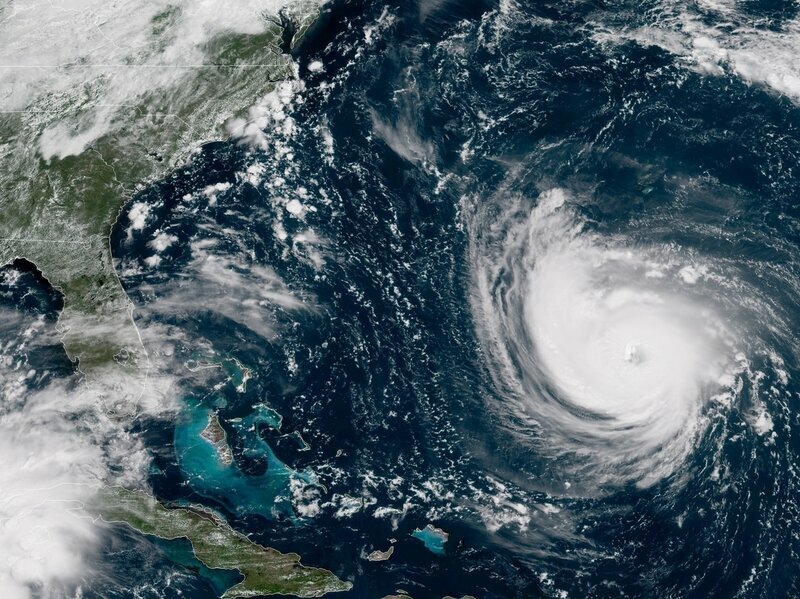 Other parts of North Carolina and South Carolina will see a lot worse. Last weekend, I attended a Sashiko workshop at my monthly guild meeting. 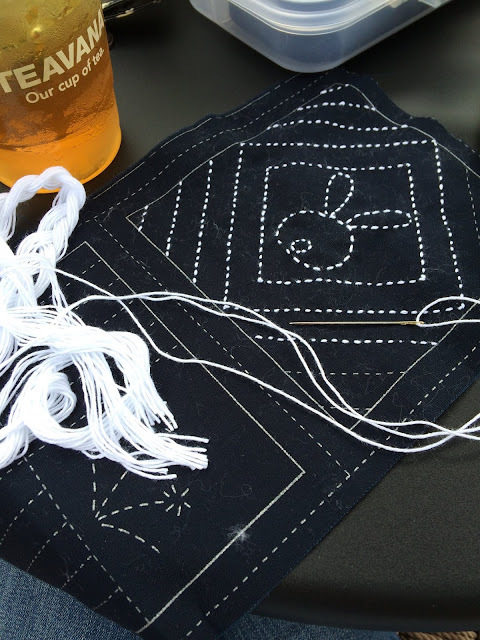 In addition to learning this basics of the stitch, we also learned a bit about this simple hand embroidery technique which originated in Japan during the Edo period. Many of us started work on our samplers in the meeting and I managed to work on it a bit more since. But then I decided to put it aside (reluctantly) to save it for the storm. 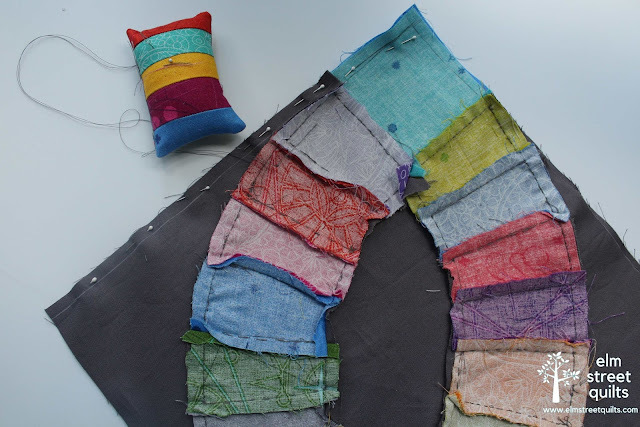 Like most hand stitching, this is a very relaxing and calming activity. When the winds howl, rain falls, and the power flickers, I will be stitching away. I will be worried about everyone in the storm's path. Stay safe! I am just in love with my finished Sew Together Bag - so much so that I think I may make another one - in the same fabrics - for me!! This bag was gifted to a friend who gives me plenty of encouragement and advise about my quilting. I hope she likes it! This is the second of these bags that I've made. My secret to success is two-fold. First, take it slow - make the bag across several days, never trying to do too much at once. 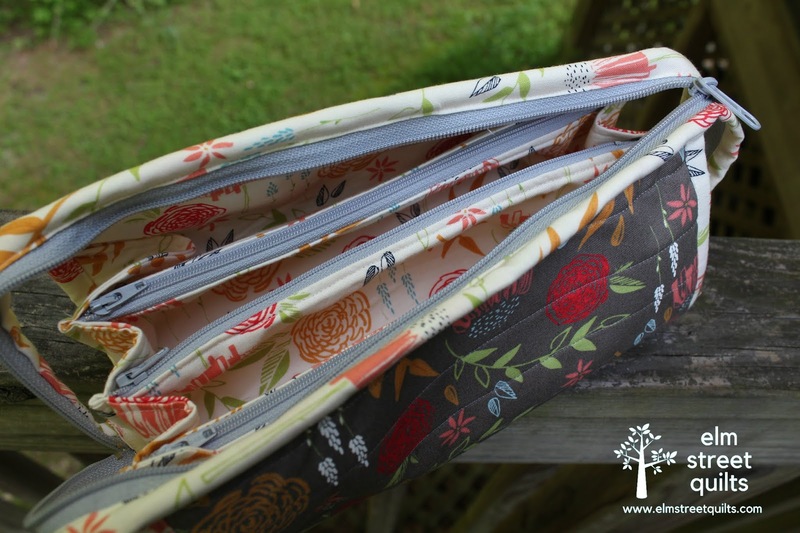 Second, seek out some on-line tutorials - for example, I find these posts about Sew Together Bag constructions to be incredibly helpful. My first STB is filled with all the supplies that I need when I travel with my machine. I just love how much I can fit inside! This is something so incredibly satisfying in creating a new pillow for my home. The pillow front is based on Latifah Saafir's Airshow pattern and from the workshop she held for my guild in August. (See that post.) For the back, I used my own tutorial for creating a zippered pillow back (tutorial), using fabric used on the front of the pillow. The fabrics are all Moda Sweetwater and they've been in my stash for quite awhile. It was nice to use them! The pillow itself was 18'' (finished) and I filled it with a 20" pillow form. To quilt, I did straight lines about 1" apart, stopping and starting around the bias tape applique shapes. Within the shape, I did one loop around. 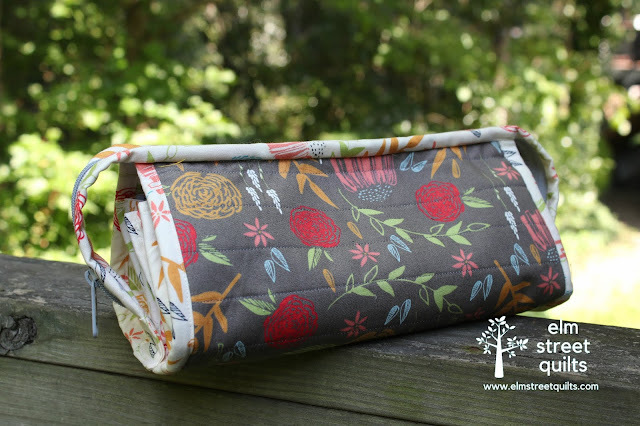 Although I didn't use it for my pillow, Latifah should us how to get a really nice finish inside your pillow - a really good idea if you are gifting. (Latifah's Magic Pillow tutorial is here.) It would work really nicely especially if you choose not to quilt the back. Latifah really made bias tape applique simple. I've practiced at home since the class with some success and look forward to doing more. I linked up at Brag about your Beauties. 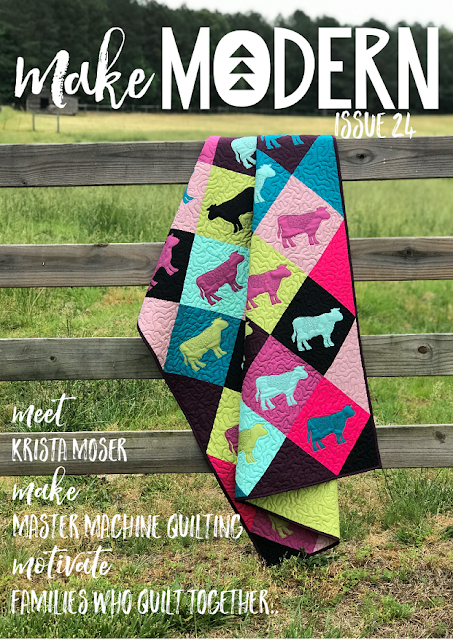 Latest issue of Make Modern magazine is available! 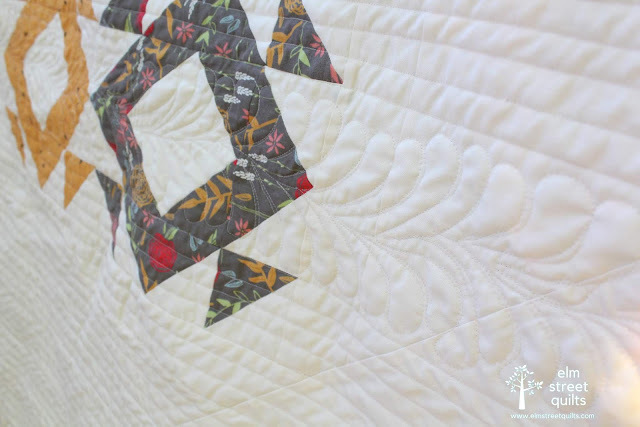 One of my favorite parts about blogging is the opportunity to work with companies in the quilting industry and help spread the word about their great products and service. Make Modern Magazine is one of those companies. Make Modern Magazine is a digital magazine that publishes 6 times each year. 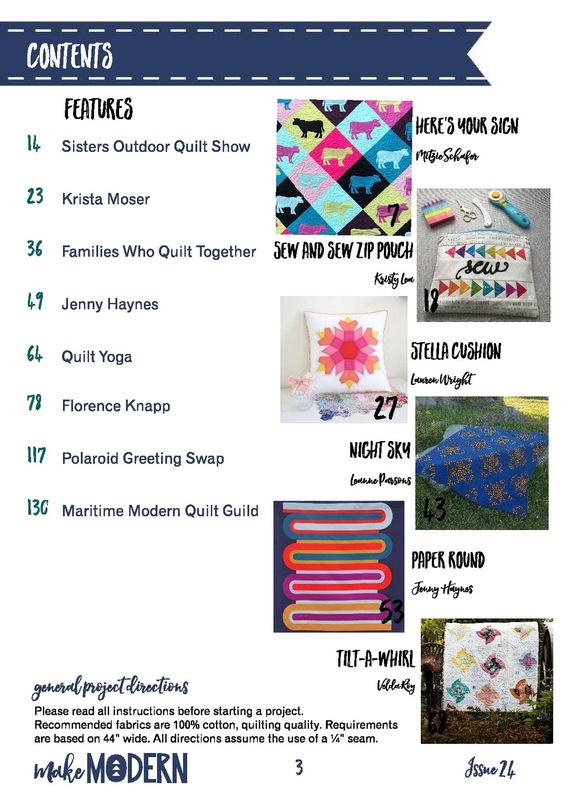 They are a wonderful sponsor of the One Monthly Goal link-up and I was excited to have a quilt published in issue 23! Today, issue 24 becomes available (Look at those cute cows on the cover shot above!) Check out the first page of the table of contents - I've added that Stella cushion to my make list - it is stunning! 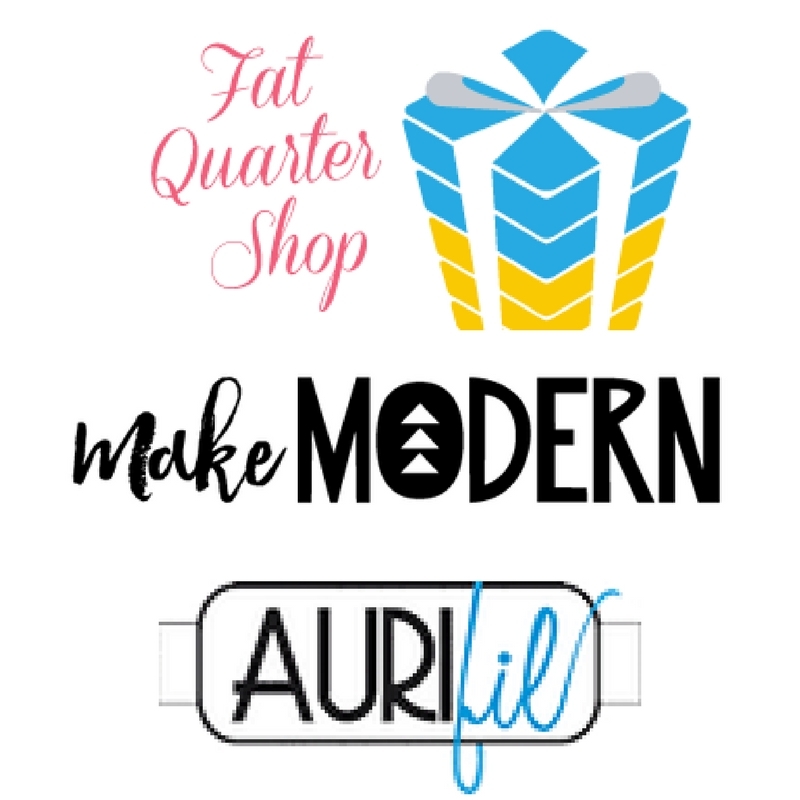 I am now an affiliate* for Make Modern Magazine and happy to share these links with you. 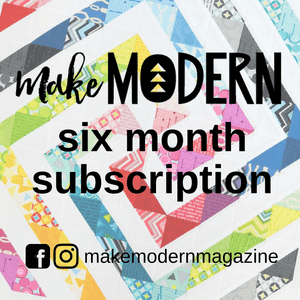 Subscribe to Make Modern Magazine and be inspired. Interested in just the most current issue? Shop here and use code MM2446 and receive this issue at a sale price of AUS$6 (roughly $4.32 US!) This code is code until Sept 9 (midnight Australian time) so order soon. 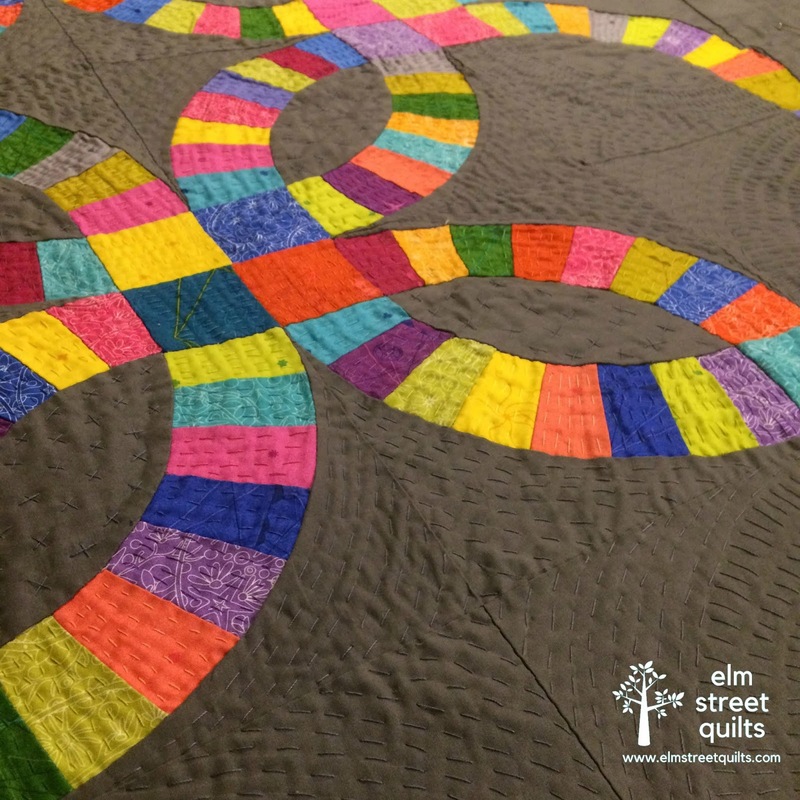 Welcome to Elm Street Quilts! I'm happy to be one of the bloggers participating in the Bloggers's Meet and Greet. You can find more about this month long event, meet new bloggers and earn entries for a fabulous prize by heading over here to the main event page! Whether you are a first time visitor or have been a reader for awhile (thank you for that! ), I hope you'll find plenty of inspiration and motivation on my site. 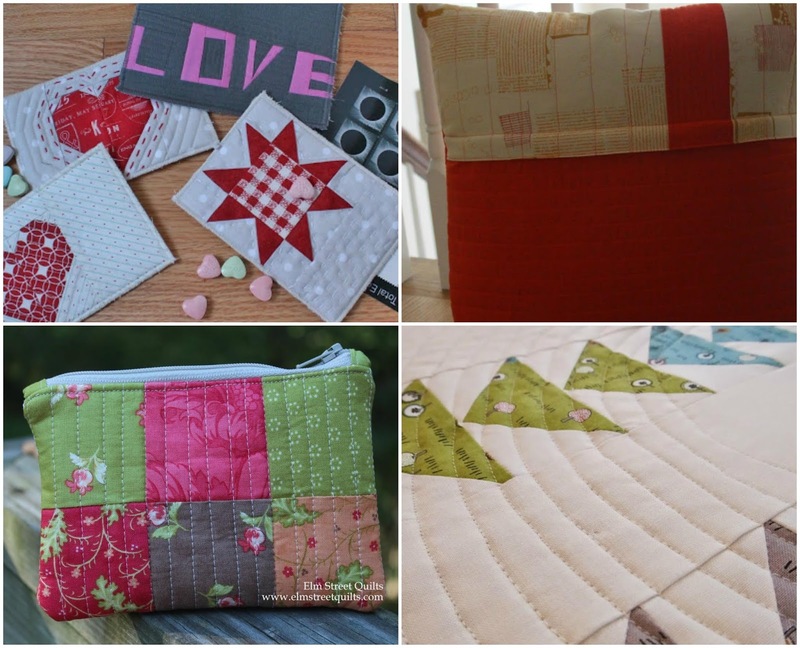 I've been quilting for over 20 years - my love of quilting starting when I created bed quilts for each of my kids. My kids are now all in their 20s and are still my favorite people to make quilts for. My blog is a journal of all my quilting projects along with tutorials, QALs and the monthly goal setting link-up. Need a bit of incentive to make progress on your UFOs (unfinished objects) or WIPs (works in progress)? Check out One Monthly Goal. 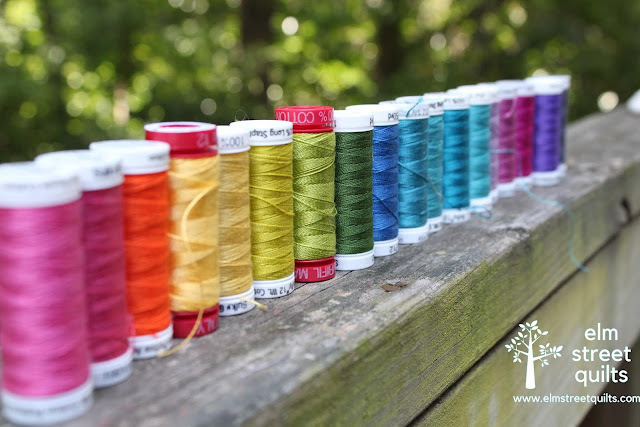 Each month, share on your blog or on Instagram your goal for that month - anything making with fabric and/or thread/yarn qualifies. Return at the end of the month to share your success and enter for a chance to win a fabulous prize from our sponsors. Read about the overall event here and (if you read this post on or before September 7), just the September One Monthly goal link-up! While I have UFOs littering my sewing space, I do tend to finish quilts. One of my recent finishes was called Encouragement (see the blog post) made for my daughter's teacher upon my daughter's high school graduation. I love this quilts for many reasons beyond the special person I made it for. To quilt, I used a combination of straight line quilting and then some FMQing, a technique I've used on a couple of quilts so far. I also love it because of the bright colors (Alison Glass Sunprint 2018), loving them so much that I gathered up all the scraps for my current WIP my double wedding ring. I love posting tutorials and you can find dozens on my site. (Check out the tutorials tab to see them all.) 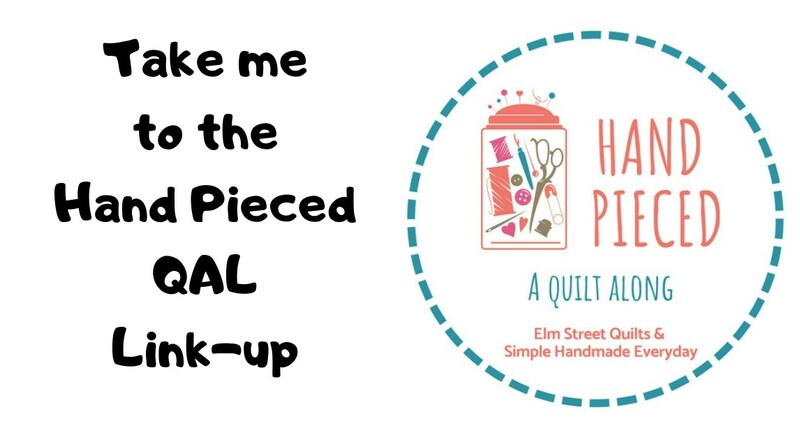 Make a fabric postcard, a simple zipped bag, install a zipper in a pillow back or learn about spiral quilting! Each year, I run at least one QAL or swap. Earlier this year, it was a fabric postcard swap. Next year, I'm collaborating with a friend for a QAL. We've not yet announced the details but plan to do so soon. Thanks for visiting and I hope you'll be back. 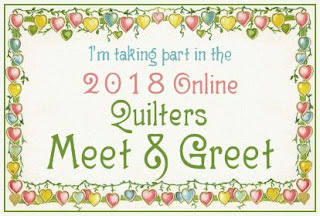 I really enjoy connecting with other quilters! Subscribe to my newsletter in order to not miss anything! And check out the Meet & Greet to meet some other bloggers! I am so thrilled I am doing this quilt - it is fun to look back on a month. August clearly was hot - more than half the days were in the 90s. September days will start to cool things down so it will be fun to use something other than red and orange! The first column (of color) on the left is January 1 through 15, next column January 16 through 31 etc which means the last column on the right is August 16 - 31. I'm using a low volume fabric to fill in months that don't have 31 days plus surrounding the overall temperature quilt. 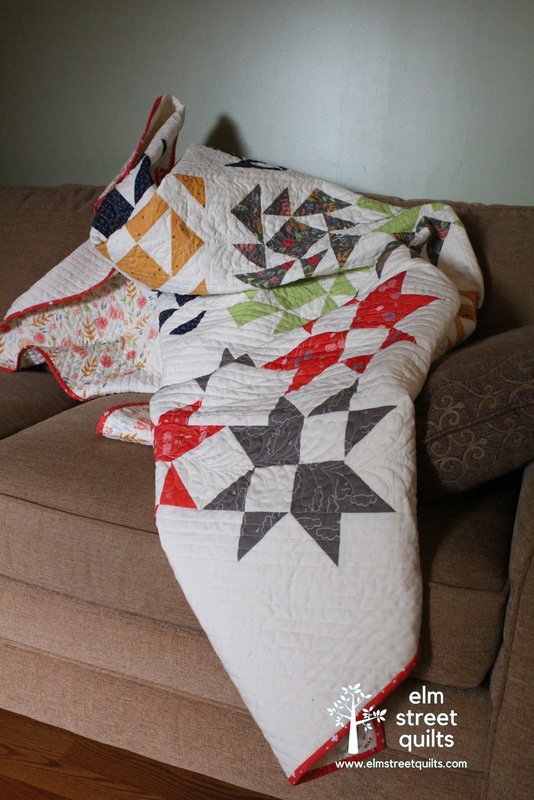 The quilt measures roughly 32'' x 25''. Still no days over 100 degrees yet here in NC and now as we march closer to fall, it is less likely there will be one. It did hit 95 at the end of the month so still possible. I'll be linking up my wip with Freemotion by the River, WIP Wednesday's, Let's Bee Social, Midweek Makers. Needle and Thread Thursdays, and Finished or Not Friday. Welcome to September! We had 103 projects linked up in August - let's see what this month brings! 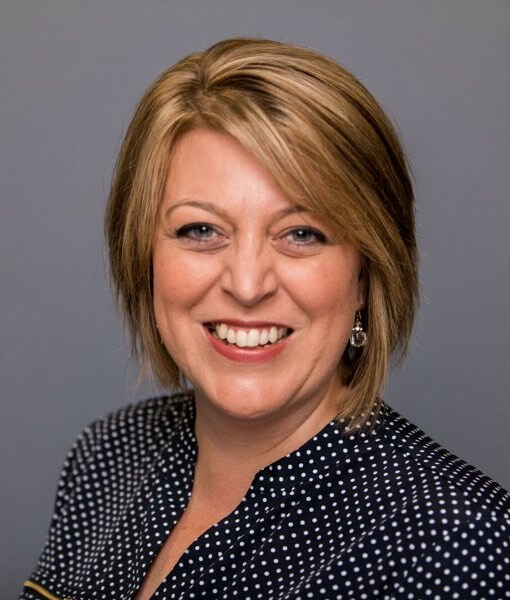 I'm excited to introduce our designer sponsor for September - Amy Ellis of Amy's Creative Side! 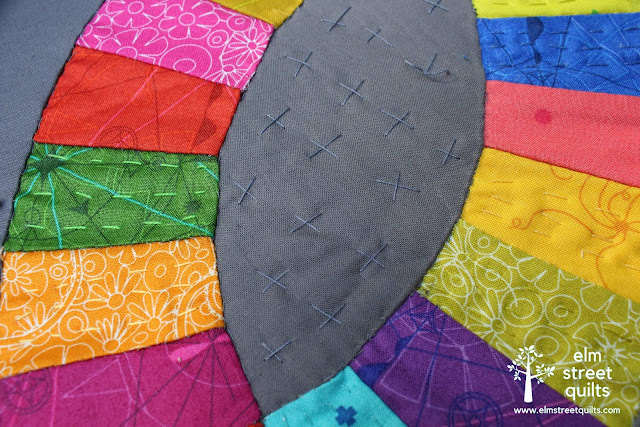 Amy is a pattern designer, book author, fabric designer, a co-creator of Curated Quilts and a strong, passionate supporter for quilter's everywhere. Her designs are eye catching and modern. Each year, Amy hosts a virtual Quilt Festival, inviting quilters everywhere to share their finishes. Working with co-creator Christine Ricks, Amy has created a quarterly quilting journal that you'll want to read through over and over again. 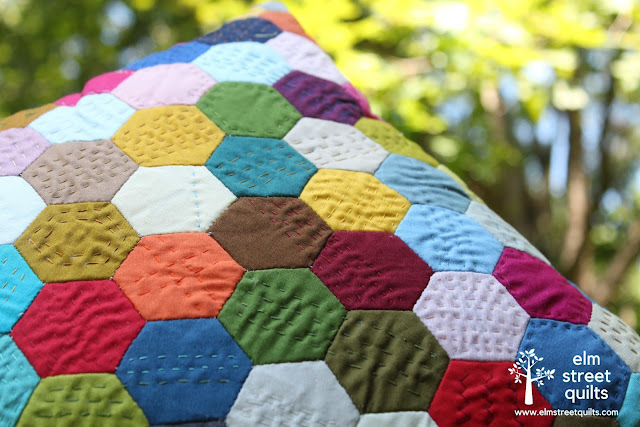 It is filled with amazing quilts and will surely inspire your own creativity. 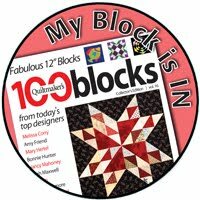 Curated Quilts runs a contest quarterly for mini quilts (see the last one) and invited quilters to submit their minis for the challenge. Images and quilt credit to Amy Ellis. Pictured: Curated Quilts Journal, Waterfall Quilt Pattern & Modern Heritage Quilts book. 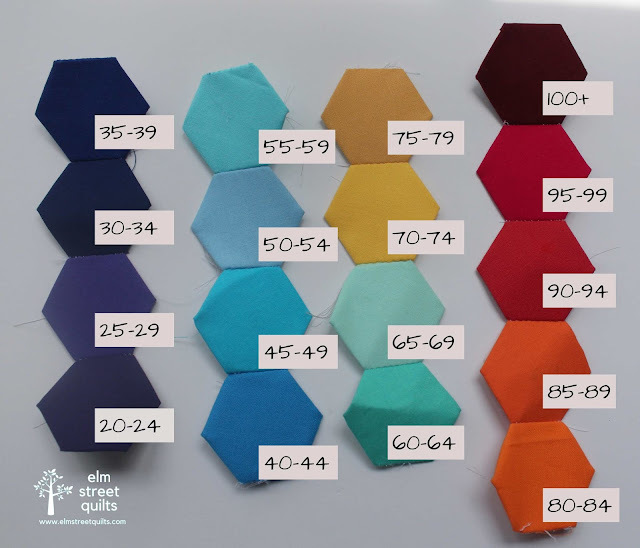 Amy is offering a $25 gift certificate to her pattern store to one lucky winner! 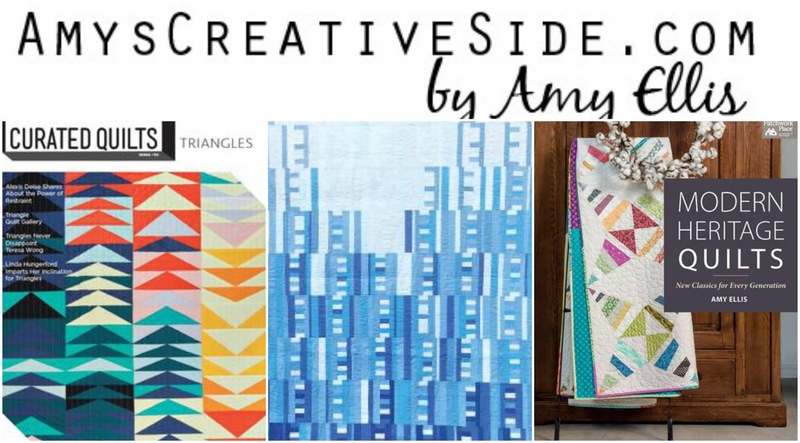 You can visit Amy on her blog, on Instagram, on Facebook and her pattern store. You can also find her at Curated Quilts. 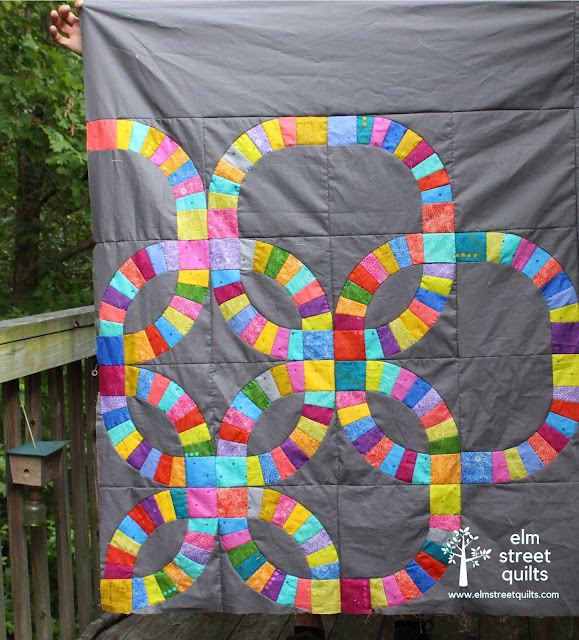 My goal for September is to do all the 'color' hand quilting on my double wedding ring quilt. Getting any of the background done (gray) will be a stretch goal. 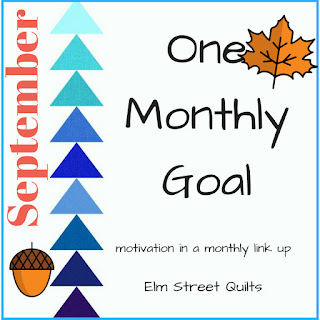 Elm Street Quilts One Monthly Goal September Linkup.